Marla, the owner of Crazy 8’s French Bulldogs, emailed us a few weeks ago asking about our website design services. She just started doing french bulldog breeding and wanted a website to showcase pictures of the pups and the parents with other text about her experience and the dogs. We created the basic three page website and also added on mobile device compatibility to the site. The site has now been approved and is published! 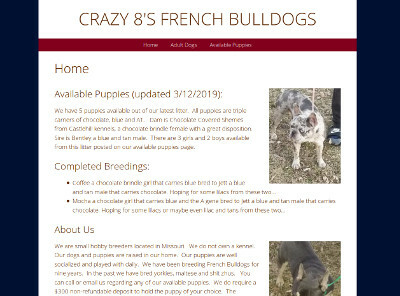 The website for Crazy 8’s French Bulldogs is at crazysfrenchbulldogs.com.